Motordepot has once again broken new ground, this time by offering a sensational 'no strings attached' free car giveaway on December 23rd, 2013. It really is that simple and - hardly surprisingly - the offer has caught the imagination of the general public with over 2,500 'likes' registered in the last month and hundreds more being added each day. 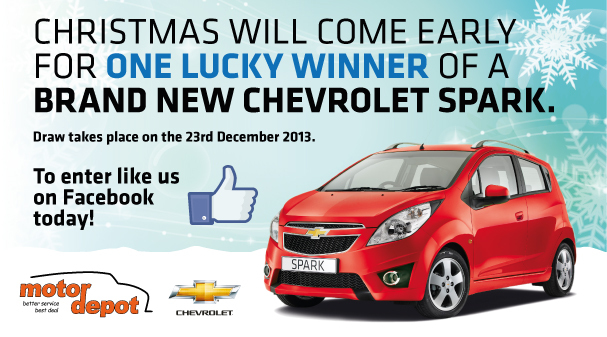 According to Motordepot's Managing Director, Steve Butterley, the free car giveaway is a 'win-win' situation for both the company and Facebook users alike, and he expects the 'buzz' around the offer to continue all the way up until the day of the draw. He said: "We are absolutely delighted with the response so far and, just by sheer word of mouth, we expect the numbers to snowball all the way up until the day of the draw. Its a fantastic, unique offer and is helping us achieve our strategic objective. "Building a stronger presence within social media is a key element of Motordepot's plans moving forward. Not only does it enable us to augment our brand, but it also allows us to connect with people in a quick, convenient and direct manner. "Obviously, the new car giveaway is the headline grabber, but anyone who 'likes' our page will be the first to hear our latest offers, other giveaways, and any Facebook-only deals. It's definitely a win-win situation." To increase further interaction, Motordepot has been allowing entrants to the free car giveaway to have their say on which colour it should be, with the intention being to supply the most popular colour voted for by the public. As it stands, Urban Titanium Grey and Carbon Flash Black are running virtually neck and neck, with almost 50% of the vote between them. Noted for its striking looks, the Chevrolet Spark is a city car with all-round appeal, owing to its clever, intricate design details and low running costs.